In March of 2002, Judy Mathieson had a Mariner's Compass class scheduled at one of my local quilt stores. I was simply amazed ... Judy is THE expert when it comes to drafting and constructing Mariner's Compass blocks. She creates the most visually intricate and astounding quilts. It was without a doubt that I wanted to take this class. I've always admired Mariner Compass blocks, but those long skinny spikes were intimidating. Judy uses a fantastic paper piecing method by using freezer paper. You don't sew through the freezer paper but use it as a sticky-note sort of template ... when done stitching the paper pieced unit, you are able to peel off the freezer paper template and REUSE it ... over and over and over ... until the freezer paper loses it's "stickiness". With her technique, you get all of the advantages of paper piecing but none of the tediousness of removing the sewn paper afterwards. The first part of the class was devoted to the mechanics of drafting our own Mariner's Compass ... so that we would be able to draw our own if what we envisioned wasn't commercially available. The remainder of the class was actually constructing the Mariner's Compass from the pattern we had just drawn ...using Judy's freezer paper piecing technique. Using the class supply list, acquired before the class, I assembled a massive amount of stash fabric to bring to class. Not knowing specifically what value/color of fabrics were going to be needed where, I knew that the more choices I had available to me in class, the better my finished project would be. Although I could have bought appropriate fabrics in the store during class time, I wouldn't have been able to wash the fabric before I used it ... and pre-washing fabric is one of my standing rules. 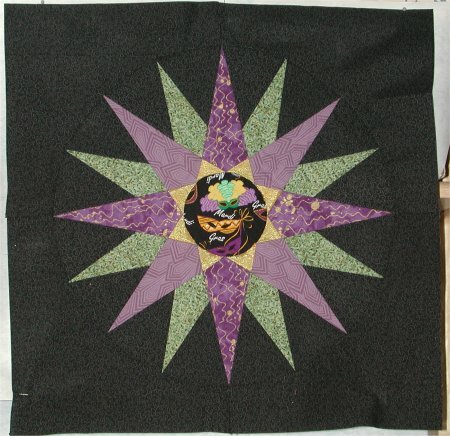 While I didn't have an exact idea in my head of the finished Mariner's Compass before I took the class, I had seen a Mariner's Compass sampler quilt in a quilting calendar. This quilt was quite striking and was my inspiration for this class ... I would incorporate the class Mariner's Compass in a sampler quilt! The photo above is my class project. I used a Mardi Gras print as my center focal fabric.